Alibi Room is a Gastown staple known for it’s unbelievably large selection of craft beers on tap. Having around 26 taps going at a time, the pub rotates new beers in all the time and posts beer related updates via Twitter. Although the beers are the main draw here, the food menu is formidable and diverse – featuring everything from Smoked Sablefish to Lamb Sirloin to Red Coconut Vegetable Curry. To accompany our beers, we ordered Smoked Albacore Tuna salad with crutons, carrot, daikon, pumpkin seeds & creamy miso dressing along with BC Bison cheese steak with spiced bison flank, peppers, onions & cheddar. Pumpkin seed ‘slaw and fries and BBQ Pork Belly sandwich with beer braised onions, jalapeno ‘slaw & fries. The smoked albacore dish was a large portion and had a great summer taste with the miso dressing, pumpkin seeds and daikon. The Bison Burger (one of the more popular dishes) and the Pork Belly sandwich paired perfectly with our beers and tasted great. 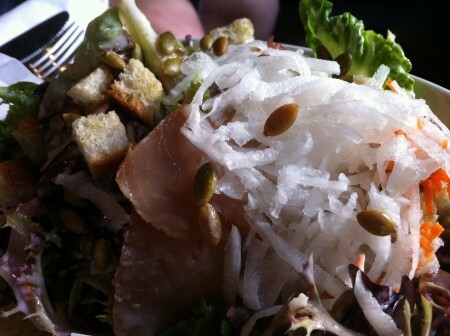 The Pumpkin seed slaw and Jalapeno slaw were welcome additions as well. Tags: Beer, Burgers, Salad, Tuna, Vancouver.